Bring a large pot of salted water to boil. Add the spaetzle and kale. Cook according to package instructions, about 10-12 minutes until the spaetzle is tender. Meanwhile, saute the onion and mushrooms until the onions are nearly caramelized. Add the drained spaetzle and kale, saute 1-2 minutes until well combined. Remove from heat and stir in cheese. Serve immediately. I love spaetzle but rarely make it at home. I found a big bag and thought I'd have to change that! 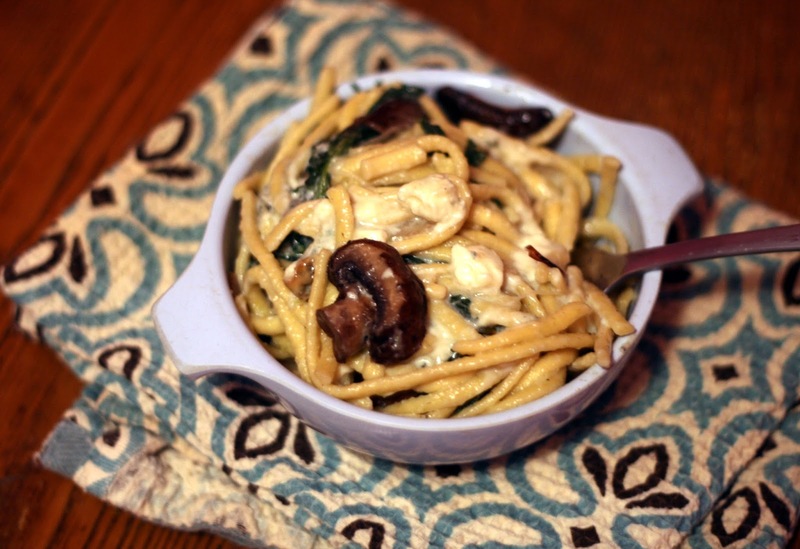 The kale and mushroom makes it a full side dish and the cheese is an easy short cut to creamy flavor. A fun and quick(!) alternative to macaroni and cheese.